Scott's Locks - Alarms/Security, Locksmith based in Marston Magna, Somerset. 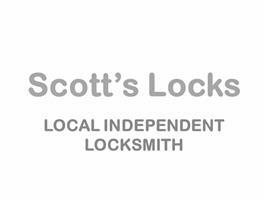 Scott's Locks is a family run business and solves problems on all types of locks, keys, handles etc to clients throughout the local area. The company is based in Somerset, but we also serve Dorset & Wiltshire. We have Public Liability Insurance, so all customers can be confident that all the work will be carried out in a quick, efficient and professional manner resulting in competitive prices. We have an expanding customer base, based in the Somerset & Dorset area. A complete service is available for Landlords, Maintenance Companies and Letting Agents throughout Somerset and Dorset at special rates and credit terms subject to application. Scott's Locks are available and willing to service your portfolio with a personal and priority service. Whatever your requirements are, we will meet and exceed your expectations! Master suite systems supplied & fitted. We aim to be with customers within the hour however, you will be given an estimated time of arrival on the phone. I carry full kit and tools on-board so I should be able to fix the problem there and then however if it requires a part I do not have I will make your property secure and return the following day with the required part. No call-out charge & NO VAT TO PAY! I am fully insured and DBS Checked!